Filmmaker Asghar Farhadi and actors Shahab Hosseini and Taraneh Alidoosti got an overwhelming welcome in Tehran after arriving home from the 69th Cannes Film Festival, where Farhadi won the best screenplay prize and Shahab Hosseini received the Palme d’Or for best actor. The film, whose screenplay was also written by Farhadi, is about Emad (Hosseini) and Rana (Taraneh Alidoosti) who move into a new flat in the center of Tehran. An incident linked to the previous tenant dramatically changes the young couple’s life. Shahab Hosseini and Asghar Farhadi had worked together in “A Separation“. The first Iranian film to win the Academy Award for Best Foreign Language Film in 2012. “A Separation” also won the Golden Globe for Best Foreign Language Film and the Golden Bear for Best Film and the Silver Bears for Best Actress and Best Actor (Shahab Hosseini and Peyman Moaadi), becoming the first Iranian film to win the Golden Bear. Farhadi’s “The Past” (Le Passé) had been nominated for a Palme d’Or in 2013. This entry was posted in Cinema, music and arts and tagged Asghar Farhadi, Awards, Cinema, Film, Iran, Personalities, Photos, Shahab Hosseini, Taraneh Alidoosti on June 13, 2016 by socialinform. Academy Award winning Iranian filmmaker has been selected to preside over the jury for the New Currents section at the 19th Busan International Film Festival in South Korea. Farhadi will head the festival’s jury panel that is comprised of French philosopher Jacques Ranciere, Professor of film studies at the Scotland’s University of St. Andrews Dina Iordanova, Indian actress Suhasini Maniratnam, and Korean filmmaker Bong Joon-ho. The Iranian director Mohammad Mehdi Asgarpour’s drama We Have a Guest is also scheduled to compete at the festival which will take place from October 2 to 11. 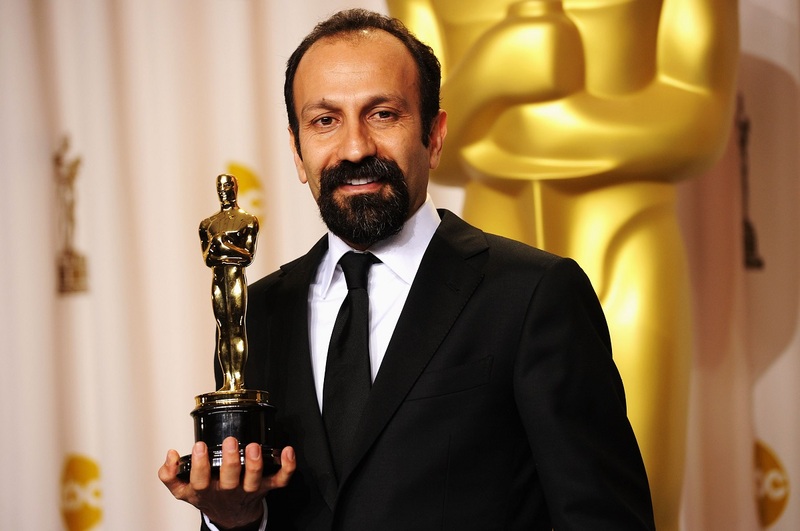 Born in 1972, Farhadi received his Bachelors in Theater from University of Tehran’s School of Dramatic Arts in 1998 and his Masters in Stage Direction from Tarbiat Modarres University a few years later. His 2011 family drama A Separation became a sensation and received rave reviews from numerous international film events and festivals. The film won the award for the Best Foreign Language film at the Golden Globe Award and Academy Award in 2012. “Farhadi is a filmmaker who makes one becomes familiar with the rich culture of Iran. His works remind us of Victor Hugo,” The mayor of Paris, Bertrand Delanoe had earlier said during an award ceremony during which the Grand Medal of Vermeil from the City went to Farhadi for his latest drama The Past (Le Passé). The Past has scooped numerous awards so far such as two prizes at the 66th Cannes film festival including the Best Actress award and the Prize of the Ecumenical Jury (prix du Jury œcuménique). Dancing in the Dust (2003), The Beautiful 2004), Fireworks Wednesday (2006) and About Elly (2009) are his other directorial works. This entry was posted in Cinema and tagged Asghar Farhadi, Awards, Cinema, Iran, Personalities, Photos on September 23, 2014 by socialinform. The culture minister of France presents the order to a person who has made significant contributions to the arts, literature, or the dissemination of these fields. Farhadi made his latest film “The Past” in France. The French-language drama brought its star Bérénice Bejo the Palme d’Or for Best Actress at the Cannes Film Festival in 2013. He received the first EU MEDIA prize for “The Past” in 2012 when the film was in its preproduction stage. His previous film “A Separation” won the Oscar for best foreign-language film at the Academy Awards in 2012. He previously received France’s César award for best foreign film for “A Separation”. This entry was posted in Cinema, Personalities and tagged Asghar Farhadi, Awards, Cinema, Iran, Personalities, Photos on February 27, 2014 by socialinform. A Separation (Persian: Jodái-e Náder az Simin, “The Separation of Nader from Simin”) is a 2011 Iranian drama film written and directed by Asghar Farhadi. Farhadi focuses on a middle class family in Tehran to explore the tensions and challenges of modern Iran. By examining class, religious and gender conflict through the intimate lens of family life, he highlights the interconnection between the personal and political. The lecture identifies and analyses the multiple pressure points within the film narrative and the central idea that the very things that connect us as human beings also separate us. A Separation won the Academy Award for Best Foreign Language Film in 2012, becoming the first Iranian film to win the award. It received the Golden Bear for Best Film and the Silver Bears for Best Actress and Best Actor at the 61st Berlin International Film Festival, becoming the first Iranian film to win the Golden Bear. It also won the Golden Globe for Best Foreign Language Film. The film was nominated for the Best Original Screenplay Academy Award, making it the first non-English film in five years to achieve this. This entry was posted in Cinema and tagged Asghar Farhadi, Awards, Babak Karimi, Cinema, Culture, Film, Iran, Leila Hatami, Merila Zarei, Personalities, Peyman Moaadi, Photos, Sareh Bayat, Sarina Farhadi, Shahab Hosseini on December 26, 2013 by radioyaran.